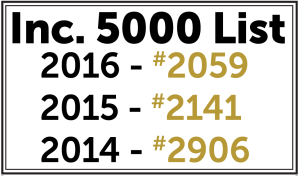 FCR, the premier provider of outsourced live agent call center and business process solutions, announced today that it has once again made the Inc. 5000 list for the fastest growing private companies in America for the third consecutive year. FCR was ranked at 2,059, moving up 82 ranking positions from last year when the company was ranked at 2,141. The list is ranked according to percentage of revenue growth over a four-year period. All companies in the Inc. 5000 list are based in the United States, privately held, and independent. To qualify each company’s revenue in the initial year must have been at least $200,000, and revenue in the most recent year must have been at least $2 million. FCR’s ranking was based on revenues of $48.7 million in 2015 with a 3-year growth of 181%. Headquartered in Oregon, with facilities in Roseburg, Grants Pass, Coos Bay, Veneta, Eugene, and Independence, FCR has built a new class of high-quality, domestic-based contact center and business process outsourcing solutions. The company provides a wide range of outsourced call center and business process solutions to industries that include high tech, startups, mobile commerce, wireless, telecom, finance, insurance, e-commerce, healthcare, retail, travel and hospitality, and various sectors of the new economy. FCR currently supports more than 60 clients and employs over 1,600 colleagues across seven facilities. FCR is changing the face of the outsourcing industry, one call, email, instant message, text, and video conference at a time. To learn more about the company, visit www.gofcr.com for further information.